Garonga Safari Camp with its organic flowing space reflects the flow of the African bushveld, this camp is your sanctuary. Experience the tranquility of this African oasis sheltering you from the wilderness. The architecture conveys the feeling that the termites have combined forces over eons to build a monument celebrating nature. Garonga Safari Camp is your sanctuary big game experience, total privacy and exclusivity, private pool and deck and bush walks are enjoyed daily. In the middle of the South African bush inspired by the ochre-red spires of nature's termite mounds, thick earthen columns, generous cushions on low beds and billowing white fabrics symbolize luxury. 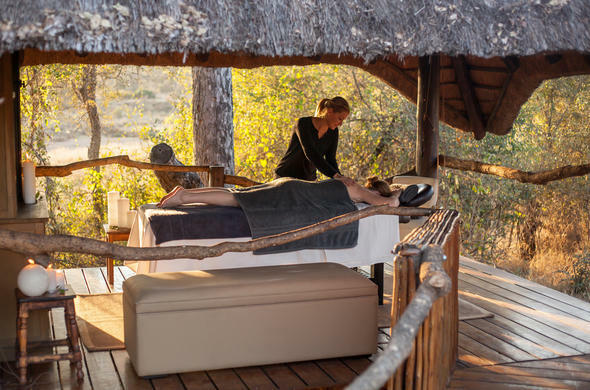 Garonga Safari Camp activities include game drives, wilderness walks, outdoor bush baths, sleep-outs, aromatherapy and reflexology sessions are available or guests can lie in their hammocks and watch the animals grazing. Garonga offers the kind of holisitic wildlife experience and relaxation you will search the earth to find. Have an outdoor candlelit bath under the stars or be pampered by the resident aromatherapist while gazing languidly over the nearby waterhole. Celebrate the most memorable days of your life at Garonga, and let the team of professionals assist you in planning your perfect wedding.